In true British fashion, I'm writing a lovely summery recipe and a thunderstorm is brewing outside my window. Typical. Anyway let's just to pretend it's sunny for this post as it is a real summery treat! 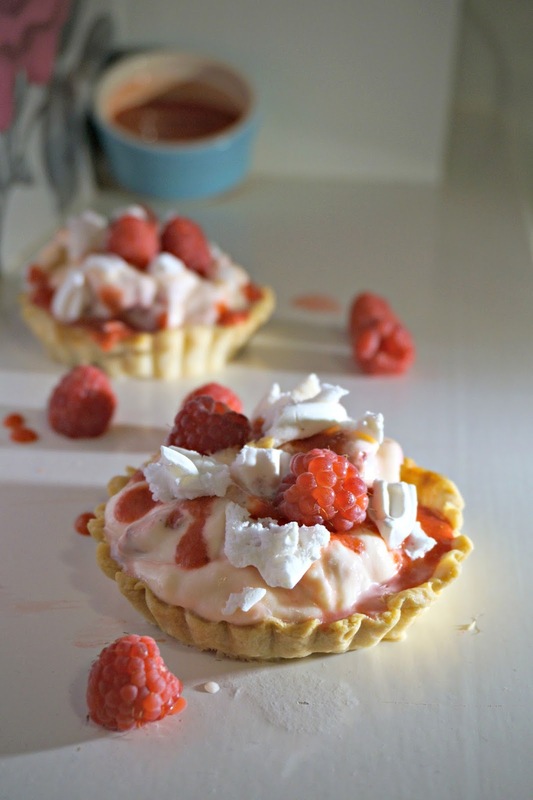 I bloody love British summer fruit so immediately I thought strawberries, which got me thinking about raspberries which got me thinking about cream which got me thinking about meringue. You can see how my greedy mind works, right? Ultimately I ended up at my favourite pudding Eton Mess but I wanted to do something a little bit different in that I created individual tartlets - and added a bit of lemon. Because everything tastes better with lemon in my book. 5. Shape spoonfuls of meringue onto baking tray and bake for 15 minutes. 1. Blitz half the strawberries and raspberries in a blender with 1 tbsp icing sugar and squeeze of lemon. Set to the side. If you have spare filling, you could serve it on top of meringue nests - or just eat it right out the bowl like i did!. Make sure you take a look at the Seasonal Berries website for more recipe inspiration or search #BerriesSaySummer on social media to see more recipes by my fellow foodie bloggers! I've also added this recipe into Belleau Kitchen's Simply Eggcellent link-up challenge - head over there for some delicious eggy recipes!